At Sunshine Service Brake & Alignment in Sparks, Nevada, we service, repair and rebuild all makes and models of gasoline engines; foreign and domestic. With A.S.E. Certified Master Mechanics doing the work, Sunshine Service is the place to have your car or small truck diagnosed. Sunshine has the ability to update your vehicle's CPU software with the manufacturer’s latest updates, saving you an expensive trip to the dealer. For Asian, European or Domestic vehicles, Sunshine is still “The Place to Go” to get all of your maintenance and repair needs performed, including your vehicle's 30, 60 or 90,000 mile required (scheduled) warranty maintenance work. If your check engine light is on, it’s best to bring your vehicle in for diagnostic testing. While the lights vary in appearance from vehicle to vehicle, all have the same basic meaning: There’s a problem with the car’s emissions system. The on-board diagnostics system and engine control unit are in charge of monitoring different parameters, and if they sense something unusual the check engine light is triggered. A few of the above items are quick fixes. While others are can be more timely. Though it may seem that your car is driving just fine, you may be wasting fuel and/or causing major harm to the engine. In Nevada, your vehicle will not pass the state required annual emissions test if the light is on. Bring your car down to Sunshine Service Brake & Alignment and we will diagnose your check engine code and get you back on the road. Needing a new engine in Sparks or Reno doesn’t necessarily mean that you need a new vehicle. Consider a Rebuilt/Remanufactured engine. 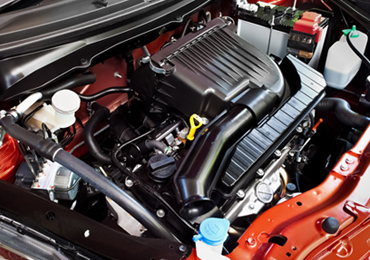 Often, Rebuilt/Remanufactured engines deliver better gas mileage and emit fewer pollutants than worn used car engines. Rebuilt/Remanufactured engines offer you an intelligent alternative to a used car purchase. Here at Sunshine Service Brake & Alignment our master mechanics will help choose the right engine for your vehicle. We offer 180 days, same as cash, interest free financing on all auto repairs based on credit approval.